PROBLEM: You’re a small business looking for new customers. We are a monthly newspaper that targets small businesses with the intention of helping to build stronger communities and help them attain their goal - to reach more customers. Our paper can be found in over 120 different businesses in areas such as Brooklyn, Old Brooklyn, Cleveland, Parma and other surrounding cities. Small business is what keeps today’s economy alive, however there seems to be less and less of them as they either seem to get bought out or fall the way of the dinosaur and just end up closing down. I grew up in Brooklyn, Ohio and it seems like there are more and more empty buildings where companies and small businesses “used to be”. During the day, I work for a small accounting firm in Brecksville. We used to have a somewhat larger company provide us with certain services until they decided to keep raising their rates and after a while we decided to look somewhere else. We found a smaller company that actually provided us with all the same services at half the price and decided to sign up with them. We’ve been doing business with them for about 4 or 5 years now and everything seems to be perfect until I received a phone call that the previous, larger company just acquired the smaller company and we will be doing business with them again. Don’t let your business, be the one that gets “acquired” because you can’t get the customers you need. That’s why we started the Northeast Informer LLC, to help the small businesses - BECAUSE WE BELIEVE IN THEM. When we ask the larger businesses if they would like to advertise with us all we get is “you have to call corporate”. You’re just a number when you call corporate and they could care less. Small businesses on the other hand, know you by name, ask how the family is doing, and “WANT” to help you! They go over and above what the bigger businesses do for you. We send out over 5,500 newspapers every month advertising local small businesses as well as having informative and fun articles. Our clients always tell us they receive more customers because of our paper. We have several different sizes and can do a write-up of your company (1/2 page minimum). You can either let us create an advertisement for you or you can give us your copy. To advertise in the Northeast Informer please call Mike at 216-800-1813 or email northeastinformer@gmail.com. 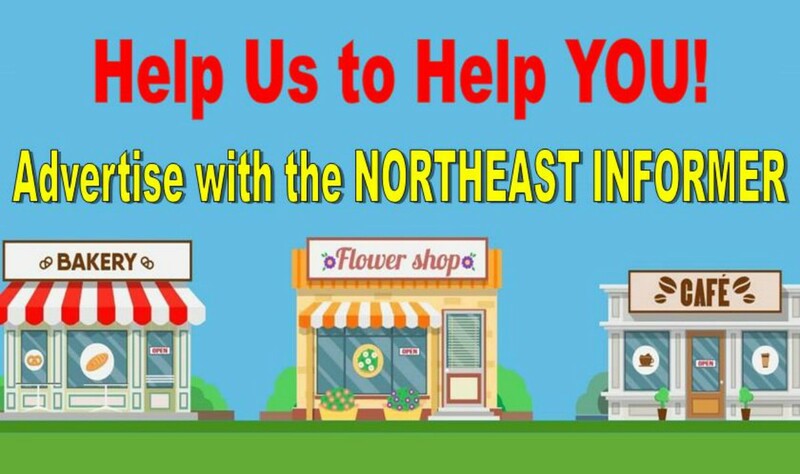 Visit our website at www.northeastinformer.com to see our previous monthly issues. We look forward to working with you.